Welcome to my fan and collector's reference web site dedicated to the one and only Brandon Lee. The goal of these pages has been to document every known item or product relating to Brandon Lee throughout his career, in an effort to help other fans in their quest to obtain those special momentos or collectibles. I have been collecting Brandon Lee memorabilia for more than ten years now and would like to share the information I have accumulated with other fans and collectors around the world. With more than 400 items featured, this is the most complete listing anywhere in the world. In the future I may add market value price guide information for many of the listings. Since this is a page about Brandon, collectibles and products from The Crow sequels have not been featured. 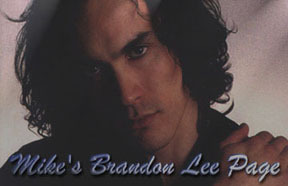 This site features information and scans of autographs and documents, magazines, memorabilia, posters, videotapes, clothing, laser discs, DVD, CDs, cassettes, trading cards, props and other miscellaneous items related to Brandon Lee - gathered from many different private collections and other sources over the years. I will be continuously adding new items as they are discovered or issued, and I am always adding more information, details and photos to existing items. If you have any questions, comments, corrections, additions or anything you would like to contribute, please email me at: mike@brandonlee.com Due to the heavy volume of email, I cannot always reply to each and every letter, but try to eventually answer as many as possible.